Low blood pressure, known as hypotension, is often overlooked as a contributing factor for fatigue and diminished brain health. Those with a blood pressure below the recommended 120/80 are often told that their numbers are terrific with nothing to worry about. This may not be entirely accurate for some individuals. Blood pressure levels should be evaluated in context of symptoms. Fatigue, poor concentration, and feeling dizzy upon standing—or as chronic symptoms, but worse when upright—may reflect low blood pressure or hypotension. This article is a follow-up to an earlier article - Low Blood Pressure Causes Brain Atrophy. Low blood pressure may cause symptoms when it drops suddenly when arising as in orthostatic hypotension or it may be chronically too low which is hypotension. There may also be orthostatic intolerance which may have a different nuance than orthostatic hypotension. General symptoms for all concerns include dizziness, lightheadedness, fainting, blurred vision, nausea, fatigue, and poor concentration. Some individuals may have feel chilled more easily. If blood pressure drops dangerously low it may be related with shock which may lead to confusion, cold, clammy skin, rapid, shallow breathing, and weak and rapid pulse. Many may not realize that their symptoms of brain fog and fatigue may be related to diminished blood pressure, but rather blame it on other things. If you have these symptoms and a tendency towards low blood pressure, take note. Frequent or ongoing low blood pressure may be related with multiple symptoms. It may be found with pregnancy, heart problems such as valve problems, heart attack, and congestive heart failure, and endocrine disorders related with thyroid, adrenal/Addison’s disease, parathyroid, hypoglycemia, and diabetes. Addison’s disease is diagnosed when 90 percent or more of the adrenal glands have been destroyed. Autonomic insufficiency linked with Parkinson’s disease and autoimmune disorders like POTS/postural orthostatic tachycardia syndrome are linked with low blood pressure. Low blood pressure may reflect acute or chronic dehydration, anemia and blood loss, severe infections and severe allergies. Medications such as diuretics, heart medications, Parkinson’s medications or levodopa, some antidepressants, and erectile dysfunction meds may cause low blood pressure. It may be related with exhaustion and severe stress. Low catecholamine (dopamine, adrenaline/epinephrine and noradrenaline/norepinephrine) levels are another cause of orthostatic hypotension and low blood pressure. These compounds function as neurotransmitters and stress hormones. They are produced by the brain, inner portion of the adrenal glands/adrenal medulla and the sympathetic autonomic nervous system in response to stress. These neurochemicals help your body adjust to many different stresses including changes in body position from lying to standing. Very low or undetectable levels of noradrenaline and adrenaline are found in the blood, urine, and cerebrospinal fluid may be found in autonomic insufficiency and contribute to symptoms of chronic low blood pressure or hypotension. Eating large meals or high amounts of processed carbs or starches may worsen low blood pressure. Crossing your legs and low salt diets may contribute to or lower blood pressure. Heat and humidity will worsen low blood pressure, whereas cooler temperatures and climates may support vasoconstriction and blood pressure in some individuals. Some nutritional supplements when taken in high doses or beyond personal need may affect individuals with sensitive blood pressure regulation or symptomatic low blood pressure. It is not that the nutrient is bad as it may be helping other things in the body. It does mean that there are other things to work on and that dosage may need to change. Observe your response and adjust usage accordingly. If fatigue levels worsen after ingestion of a nutrient, it may be its natural relaxation of blood vessels and other support is needed. If you are unsure if you have low blood pressure, keep track of what your levels are when you go see your health care professional. Blood pressure may also be checked at the pharmacy or grocery store, your local fire department, your chiropractor’s or physical therapist office, your parish nurse or school nurse or with your own personal monitors. Make sure the cuff fits and the arm position is correct. Keep track of your symptoms if your blood pressure was found questionable. Consecutive blood pressure measurements with resting/lying down, sitting, and standing positions with multiple timed measurements help provide a baseline of how your pressure responds to postural challenges. Your health care provider may do other tests for autonomic function, heart, blood sugar, blood counts, etc. to determine why blood pressure is low. In long-standing, complex cases where numerous causes have been ruled out and the person is still quite symptomatic, a tilt table test may be performed. This tests the autonomic nervous system response to standing and evaluates blood pressure management. This test is often used to help evaluate concerns in patients with Chronic Fatigue Syndrome/CFS, Postural Orthostatic Tachycardia Syndrome (POTS), or other disorders with autonomic dysfunction. Be aware that a short tilt table test of 2-3 minutes may miss the diagnosis. A 10-20 minutes standing tilt table test may be needed to fully see blood pressure changes and diagnose POTS/Postural Orthostatic Tachycardia Syndrome, autonomic insufficiency or other disorder related with hypotension. If room temperature with the tilt table test is cool, it may potentially inadvertently affect test results as the body constricts blood vessels in response cooler room temperatures. Blood tests may be used to evaluate endocrine function like the adrenals and cortisol and catecholamine levels as these neurochemicals affect blood pressure and blood vessel constriction. Too much of these compounds can lead to hypertension, but when there is too little of these compounds present, it may contribute to hypotension. Aging, low blood pressure and orthostatic hypotension do not mix well. Risk potential and total number of falls increase with aging. Research shows that individuals 65 years and older with orthostatic hypotension were much more likely to experience falls compared to those with normal or elevated blood pressure. Mood changes with depression may occur with low blood pressure. Low blood pressure, depression, and autonomic insufficiency are now recognized to precede the tremors and movement problems associated with Parkinson’s Disease. Meta-analyses show that orthostatic hypotension is an independent predictor of adverse cardiovascular events and a 36 percent increase in “all cause mortality”. One concern that is often not discussed with hypotension is the decrease in blood flow to the brain. Fainting, dizziness, blurred vision, decreased concentration and brain fatigue are symptoms that reflect the brain is simply not getting enough blood flow. Significant or severe low blood pressure may affect the brain and heart, even causing damage. Research tells us that long-term low blood pressure is linked with brain atrophy more so than hypertension. Please see the article Low Blood Pressure Linked with Brain Atrophy for more information. If your brain is not getting adequate circulation from diminished blood pressure, think about how it affects you with daily tasks due to increased fatigue, loss of stamina, diminished mental clarity, lower body temperature, etc. It will be harder to follow directions or participate in conversations, balance your checkbook, to make decisions, to learn and comprehend, and make new memories. If you lay down with your feet up above your heart and your energy level, mental clarity, and overall strain in the body improves, it may not just be the rest break to the muscles that causes the improvement. If symptoms improve within a few moments, it is likely that blood flow and hemodynamics have improved. This may reflect that the brain is getting more oxygen and the heart and nervous system don’t have to work so hard to nourish the brain with low blood pressures. Measures should be taken to help support blood pressure and to identify the cause for the low blood pressure. Individuals with complex autoimmune disorders often experience a myriad of symptoms including low or dysregulated blood pressure challenges. They look well on the outside, yet struggle to get through the day. This is often the case for individuals with Chronic Fatigue Syndrome (CFS), Fibromyalgia, POTS, Ehlers-Danlos, chronic Lyme, Mast Cell Disorders, and other chronic disorders with autonomic nervous system dysfunction and blood pressure challenges. Impaired blood flow in the brain, orthostatic intolerance, low blood pressure, autonomic nervous system changes are present in these disorders that often lead to the symptoms of brain fog, brain fatigue and cognitive challenges. Those with orthostatic intolerance or who have symptoms that flare when being upright have decreased brain perfusion and may not have changes in heart rate as seen in POTS. Other studies on CFS patients note decreased blood perfusion in the brain, low blood pressure, and changes in pH in muscle tissues which reflects autonomic nervous system and vascular dysfunction. CFS research published earlier in 2018 demonstrates that patients with Chronic Fatigue Syndrome have lower systolic blood pressure and more of an exaggerated rhythm throughout the day. Hypotension and orthostatic intolerance is common in CFS. Symptoms of fatigue, dizziness, poor concentration, nausea, and tremors may reflect autonomic dysregulation in the body and changes of blood flow and pressure in the brain. Researchers note that the lower the systolic blood pressure in CFS patients, the more debilitating the fatigue is. If you ask a patient with CFS and hypotension who is in tune with their body, they can tell you the same thing. Adequate hydration and salt intake are two fundamental ways to help keep blood volume up and reduce risk for low blood pressure. We need at least 2000 mg of salt per day for general health. For those with low blood pressure, that intake may need to markedly increase to 4000-6000 mg per day or higher. Use Celtic or Himalayan sea salt rather than processed table salt. Some individuals who are very weak or have sensitive systems may need to consume smaller meals four times per day rather than three meals. Large meals can cause the blood pressure to drop. Consume quality protein, complex carbohydrates, and some good fats to keep your blood sugar steady. If your energy crashes after a large meal and it is not due to food intolerance reactions or blood sugar swings, make sure you take enough digestive enzymes to help digest your meal. Do not drink large amounts of water or iced beverages with your meals as this impedes digestion. Try to rest for a few minutes after a meal rather than going back to work. Put your feet up periodically to help blood flow to the brain and heart. Compression stockings and sometimes medications are prescribed to help debilitating hypotension. 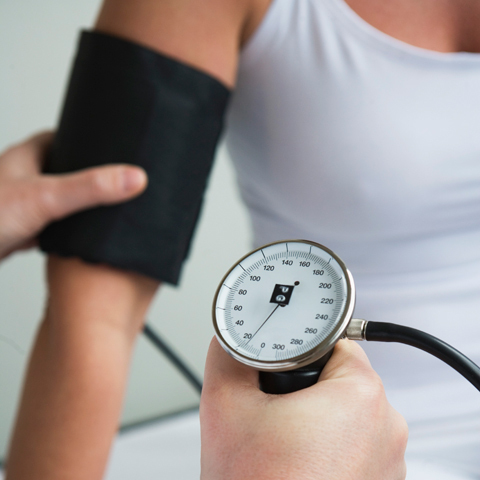 Low blood pressure is nothing to ignore, yet it is often dismissed as “normal”. If you have symptoms with your low blood pressure work on ways to naturally support it. Your brain, heart and all tissues in the body rely on a healthy blood pressure in order to do their daily duties. If your car only ran at low RPMs and was sputtering, wouldn’t you want to take it in to the mechanic to get it fixed?